The rule of thumb when trying to start a gas-powered lawnmower is: "If at first you don't succeed, try, try again." Trying too hard sometimes floods the engine, though, and when that happens, the best thing to do is cool off and find another 20-minute task to occupy yourself while the carburetor drains. If you still can't get the machine going after the cool-off period, it may be time for a tune-up and a fuel change. Still no luck? The carburetor is probably gummed up, which is likely if you've left fuel in the tank for longer than a month. Of course, none of this applies to an electric mower. If you have an electric mower that won't start, the problem may be stuck blades, but it more likely has something to do with the power supply. In a gas mower, the fuel from the tank gets mixed with air in the carburetor, which sprays a small amount into the piston chamber with every stroke of the engine. Once inside the combustion chamber, the fuel gets ignited by the spark plug. The plug is critical to the ignition process, and it's easy to change, so that's the first thing you should do. Remove the old one and take it to the store to be sure you get an identical replacement. While you're at it, drain the old fuel from the tank and replace it with fresh fuel. You can usually do this by removing the fuel line from the tank and letting the fuel run into a container. Keep the gas, though; you can add it back to the tank once the engine is running. You should also clean or change the air filter. You've now eliminated three possible causes of hard starting. 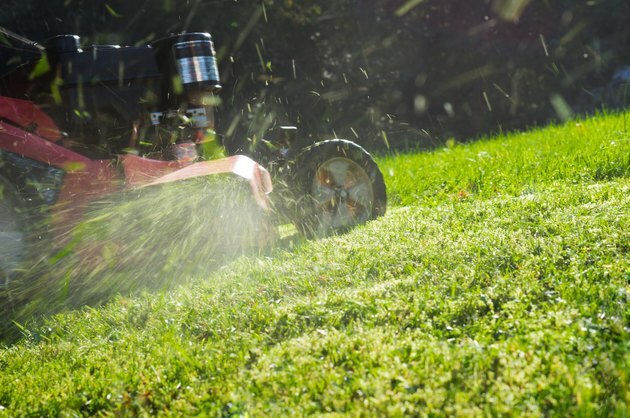 If the mower's engine still won't turn over, even though it has fresh fuel and a fresh spark plug and filter, the most likely problem is a mixture of fuel resin and moisture clogging the carburetor. At this point, the professional approach would be to remove the carburetor and clean it. If you're like most homeowners, you're not a pro and you just want to get the lawn mowed. A simple trick might get you back in business. Purchase a can of starting fluid, which costs about $5. Remove the air filter cover and pull out the filter, then spray a 1-second squirt of starting fluid into the filter orifice, which is a direct path to the carburetor. Immediately pull the engine cord or start the ignition. If you're in luck, the engine will sputter and start, blowing a cloud of smoke as it burns off gunk and excess fuel. As soon as the mower starts, replace the air filter and cover and start mowing. You can try this once or twice without risking engine damage, but no more. If the engine sputters when you add starting fluid but won't start, the lawn mower needs service. Either the carburetor is badly in need of cleaning or there's a blockage somewhere. Are You Sure You're Using the Proper Starting Procedure? Some lawn mowers have a priming bulb to fill the carburetor with fuel so the engine will turn over. You usually have to press this bulb three times. If you forget, the engine won't have any gas, but if you press the bulb too much, you'll flood the carburetor. Check the instructions for your model to ensure you're using the priming bulb correctly. Most two-stroke engines have a choke instead of a priming bulb. It should be closed when you start the engine, but sometimes that creates an overly rich fuel mixture that floods the engine. The best way to use the choke is to close it, pull three or four times, then open it and pull three or four more times. When the engine does start, open the choke immediately to create the proper fuel to air mixture to keep the mower running. If you have an older lawnmower with a two-stroke engine, you have to use a gas-oil mixture. Again, the instructions will tell you how much two-stroke oil to add to the gas, so be sure to check because proportions vary from manufacturer to manufacturer. If the mower has been running on straight gasoline and now won't start, that's a big "Uh-Oh." Time to call a pro to try to save your mower.